Son of a Peach Ale, R.J. Rockers Brewing Co.
See that? That there to the left? It’s a beer. A lovely, light, peachy beer. I know, I couldn’t believe it myself. And if there is nothing better than a perfectly ripe white peach on a perfectly cool summer’s day than there is nothing even more perfect than an ice-cold R.J. Rockers Son of a Peach ale on a hot as balls summer’s day. I drank this delightful peach ale at the equally delightful Bearden Beer Market in Knoxville, Tennessee while visiting my sister. Now that her daughters are older we can enjoy that special family time that comes with children reaching a certain age. We can leave them at home and go drink together. So that is what we did. 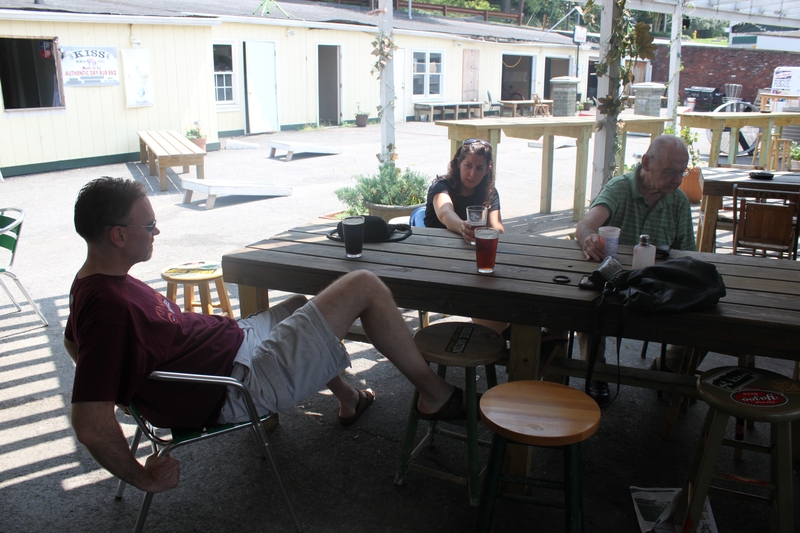 Me, my dad, my sister Stacey and brother-in-law John went to Bearden’s. You know what they say about quality time. It is not the amount of time you spend with each other, but the amount of beer you taste in that time. There is always time to be crafty. Stuck with a broken bottle top after attempting to cut someone? Two words: wind chimes! Bearden’s even has a bit of crafty in it. I could not help but admire their take on the classic wind chime – empty cans and a broken bottle neck. (right) I hope to visit again one evening so I can truly take in the chime’s full effect when the stringed lights are a glow. It must be a beautiful sight. 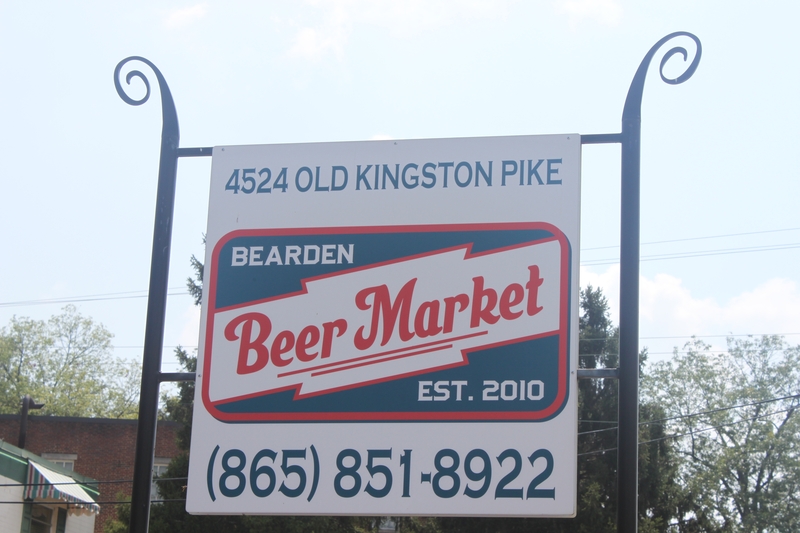 Bearden’s also has a store where you can purchase myriad lagers, ales and stouts from a very knowledgeable staff. Now, you can choose your spouses, doctors and mortgage brokers willy nilly, but your beer merchants should know what the hell they are talking about. And the gentlemen at Bearden do. Between Bearden Beer Market and McKay Used Books, I was in heaven. That heaven being Knoxville, Tennessee. Sorry actual heaven, just saying. A lesson learned from Dad: One will always feel sad and alone when drinking wine in a beer market. Click on image for more detailed view. So there we all were, enjoying our beers, bonding as a family should. Though Dad, not being a beer person, brought with him his preferred drink, red wine, in a plastic flask and drank said wine from a leftover plastic container that had contained some sort of frozen ice like treat in a previous life. But my Dad knows what is important and that is a family being together and drinking. And so he sat with us, drinking his wine, and wondering if he should have stayed at home with the grandkids after all. He is a good, good man. When our drinks were done and before we left the beer garden, we stopped inside its store and picked up a few beers that caught our eye. I have chosen a few to share with you. Note: These are reviews from someone who classifies beer in two ways: yum and yuck. So keep that in mind when reading. Also, I tend to classify beer as yum unless I can’t bring myself to swallow it. For actual informative professional and educated reader reviews , I suggest you check out BeerAdvocate.com. They delve a little deeper than said yums and yucks. Also, I am fully aware that the glasses featured below are not actual beer glasses. Thanks to a good suggestion from the folks at Bearden’s we tasted our beers from wine glasses so we take in the beers’ essence through scent and taste. We wanted to be professional in how we distinguished between the yums and the yucks. Common Ground from Fort Collins Brewing in Colorado. 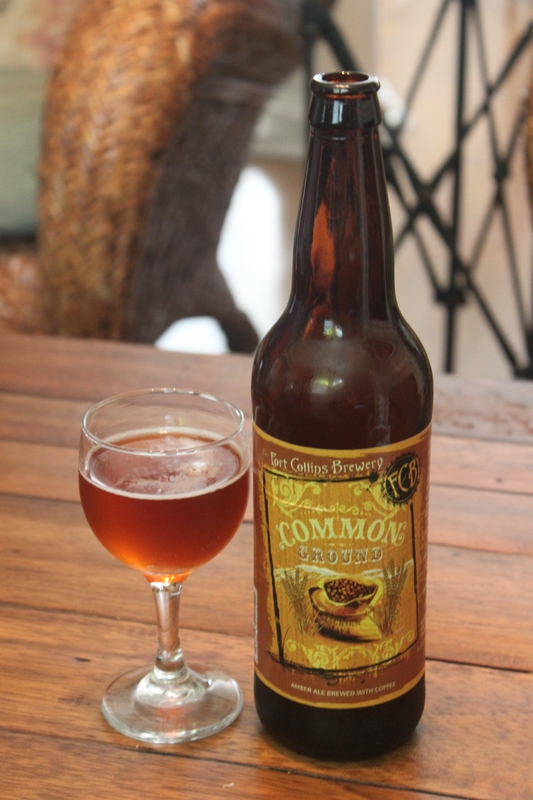 The first, Common Ground from Fort Collins Brewing in Colorado. It only made sense to start the day of tasting beers with a little coffee. Now most coffee flavored beers I have seen are more in the stout family. One being Terrapin’s Coffee Oatmeal Imperial Stout. The stout’s coffee brew shines brightly at the end of a meal, basically your dessert, coffee and aperitif all in one. One meant to be sipped and lingered over. But an ale? This was a first for me. Common Ground was a light, amber colored glass of yum. Definitely a beginning of the meal ale if you know what I mean. Though honestly I am not sure what that means so, glean what you can from my ramblings. The coffee taste is faint, a flavor you have to concentrate while drinking, or really savoring. If you want to get the most of this ale, focus on its subtleties. I know that can be difficult when drinking beer, focusing and all. I know for me, that can be tricky. Next on the list, nut beers. These are a recent fascination of mine. 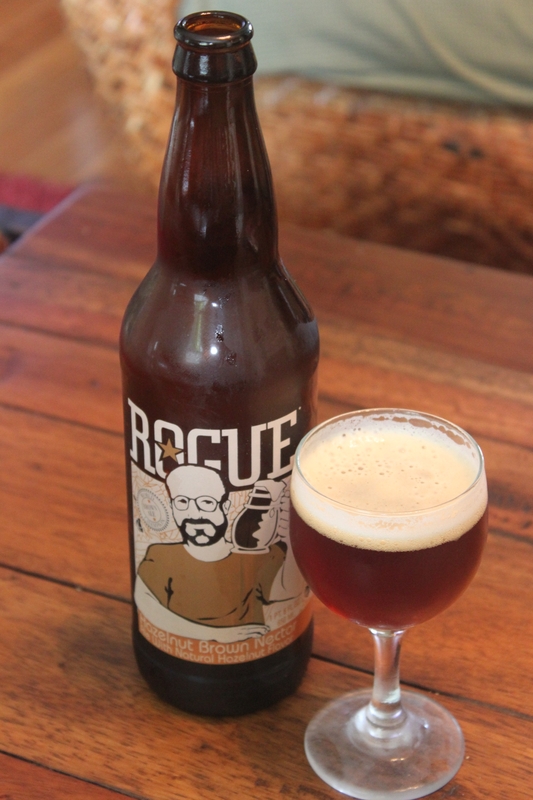 So I was delighted to stumble across a hazelnut brew – Rogue’s Hazelnut Brown Nectar. Um, well, how can I say this? Yummer! More specifically, a lovely light ale with hints of not only hazelnut but chocolate. Need I say more? Another nice nut beer I had while in Tennessee was Lazy Magnolia’s Southern Pecan Nut Brown Ale. Found in my sister’s refrigerator, it had the added advantage of being in my hand the moment I brought mine and my Dad’s luggage in and put it down. You really gotta love that in a beer. 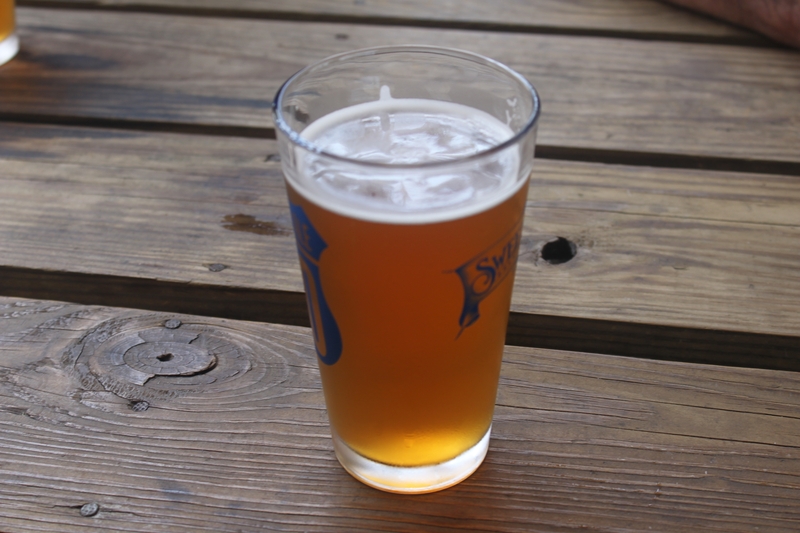 The Southern Pecan was subtle, tasty and my most favoritist feature of all, not hoppy. (What? Favoritist is a word, in my head.) Both ales have a good balance, highlighting their respective nuts without hitting you over the head with them – aka a wonderfully subtle finish. Ah fruity beers. Peach we’ve covered. Apricot I love. Strawberry beer? Put it in front of me and I will drink it, no questions asked. And while cherry has never been a favorite of mine, I highly recommend most blueberry and pumpkin varieties. And most of these fruits you think are a natural complement to most beer. But banana? Wait, hold on, I mean, banana bread? Yeah, there was no way I was not going to try this beer. I highly recommend you try it too. 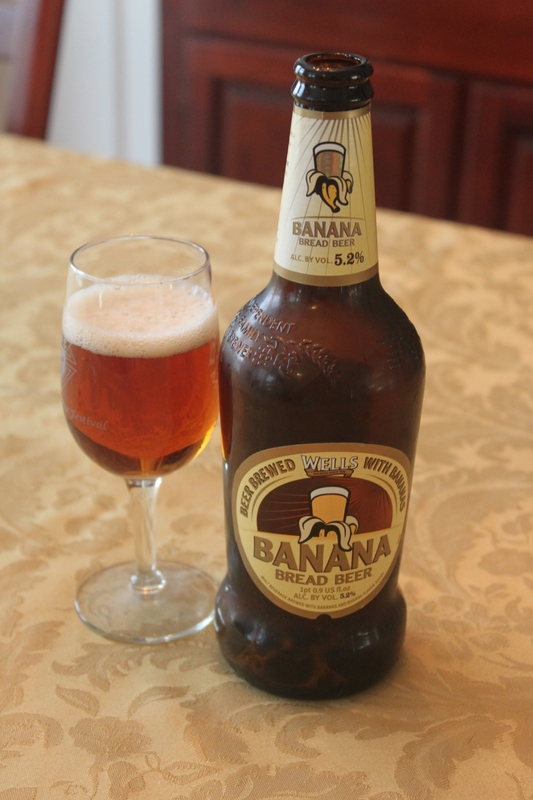 The only international entry in today’s post, Wells Banana Bread Beer from Wells & Young’s Brewing Company in the U.K. is a brew where the flavor distinctively stands out in such a lovely way. You immediately think, “bananas and beer? Of course they go together!” Yummiest. All I wanted to do was drink another one while eating a warm bowl of banana bread pudding with caramel sauce. But I can be somewhat obsessive about such things. I know, I know, hard to believe isn’t it. ooooooh, I totally want to try all those beers! In a garden! With hot, caramely banana bread! Yes, all of the above, please.